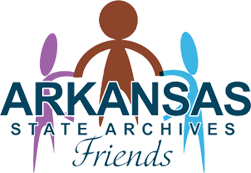 The Friends of the Arkansas State Archives is a not-for-profit organization formed in 2015 to support, promote, and strengthen the collections, services, and programs of the Arkansas State Archives. The Arkansas State Archives was created as the Arkansas History Commission by the state’s General Assembly in 1905 to preserve the state’s historical records. The Archives maintains the world’s largest public collection of Arkansas historical materials at its three locations in Little Rock, Powhatan, and Washington, Arkansas. In 2016, the Arkansas History Commission’s name was officially changed to the Arkansas State Archives, and the agency was administratively transferred to the Department of Arkansas Heritage.